Smartphones these days pack quite a punch when it comes to the sheer power of the device. From octa-core processors and high power GPUs to a mammoth 8-gigs of RAM for smooth multitasking, we’ve seen it all. So it goes without saying that they are the go-to devices for gaming these days. 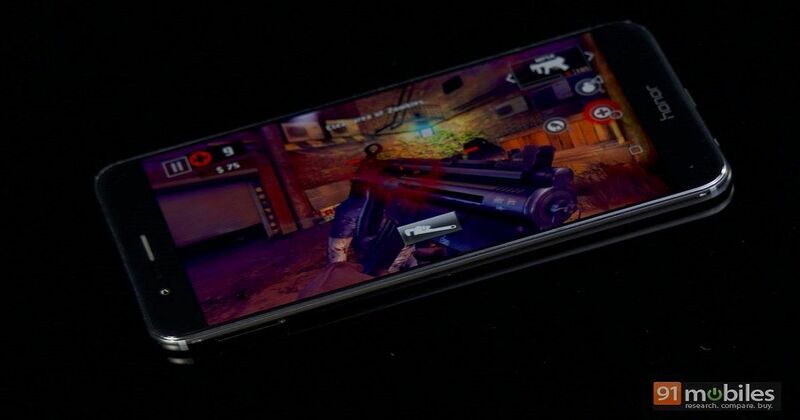 Yes, mobile devices cannot match gaming desktops, but they sure are capable of handling titles like Modern Combat 5 and Asphalt 8 without any hiccups. But the best part of this is that you no longer need to buy the Rs 50,000+ flagships to get a smooth gaming experience. That’s why today, we’ll be highlighting the best smartphones you can buy for gaming under Rs 35,000. If you’re looking for a good gaming smartphone in this range, you just cannot give the Honor 8 Pro a miss, especially after the aggressive pricing by the brand. Under the hood, the device is powered by a HiSilicon Kirin 960 SoC, which has proved its mettle against the big guns. This is coupled with a Mali-G71 MP8 GPU and 6GB of RAM for a smooth gaming experience and no frame drops. On the other hand, the 4,000mAh battery should ensure you get more playtime while the 5.7-inch QHD screen makes for a large yet crisp display for all the action. Another point worth noting here is that the device comes with 128GB of internal storage, which can be expanded further with the help of a microSD card. Of course, just like its sibling, you get dual 12MP cameras at the back, capturing RGB and monochrome info, to deliver impressive pictures. The OnePlus 5 offers an eye-catching design and powerful specs like a Snapdragon 835 SoC, 6GB or 8GB of RAM and an Adreno 540 GPU. The 5.5-inch full HD Optic AMOLED display offers bright and vibrant colours. The juice is provided by a 3,300mAh battery, which comes with the company’s Dash Charge technology to make sure you can get up and ready for a game of Plants vs Zombies 2 in a jiffy. Overall, the OnePlus 5 runs any game you throw at it with ease, something that should make the company proud. And did we mention that you also get a dual rear camera setup for the odd times you want to take some time off the games? If you’re looking for a phone with QHD display, then the V20 is among the very few options in the segment to offer it with its 5.7-inch screen. However, you’ll also find a 2.1-inch secondary ticker display above the primary one. This can be immensely useful, as you’d be able to look at your app notifications without them interrupting your full-screen games. Additionally, the audio playback quality of the V20 is also great via both the phone speakers and earphones. But what’s even more interesting is that the V20 sports a removable battery, so you can always keep a spare one with you and hot swap the batteries, when needed. Other hardware specifications include a Snapdragon 820 SoC, Adreno 530 GPU, 4GB of RAM and a 3,200mAh battery. When you notice that the Galaxy C9 Pro sports more RAM than even the Galaxy S8, then you know for sure that it isn’t any ordinary device from the Korean giant. The 6-incher comes with a full HD resolution and draws power from an octa-core Snapdragon 653 SoC, aided by an Adreno 510 GPU and 6GB of RAM. While the processor isn’t from the flagship 8XX series, it is more than capable of handling anything you throw at it without any trace of lag. On the other hand, the combination of a 1080p display and a large 4,000mAh battery make for an extended gameplay of Dead Trigger 2. The nubia Z11 is one of the few smartphones in the market offering 6GB of RAM under Rs 25,000. While gamers would appreciate the 5.5-inch full HD display, they’ll soon realise it’s got more to it with almost bezel-less sides. There has to be some caveat, right? Maybe the smartphone is underpowered? Well, if a Snapdragon 820 SoC, an Adreno 530 GPU and 64GB of expandable storage can change your mind, then the nubia Z11 is for you. In a nutshell, the Z11 has enough firepower to run most games without any issues. There you have it. These were some of the best smartphones for gaming, priced under Rs 35,000. So what are you waiting for? Be it Need For Speed, Castle of Illusion or Leo’s Fortune, these smartphones have got you covered.